Durga Puja is a Hindu festival which is celebrated on the month of Ashvin in the Hindu Calendar. By the Gregorian calendar, month of September-October. In this festival, people worship the Hindu deity, Goddess Durga and celebrate her victory over the Demon King Mahishasura. 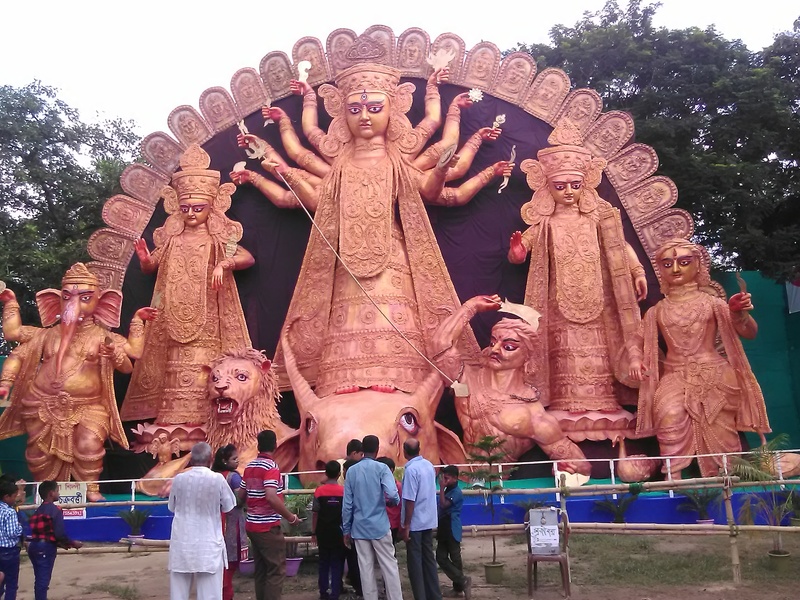 It is a multi day festival, with pandal (stage decorations), Goddess Durga idol creation, scripture recitation, cultural functions, merrymaking, and processions. The exact origin of Durga Puja is not clear. Some available manuscripts from the 14th century gives directions for Durga Puja, while historical records predict that royalty and affluent families were sponsoring major Durga Puja celebrations since the 16th century. Devi Mahatmya, a major Hindu religious text is recited during the festival while performing the worshipping rituals. 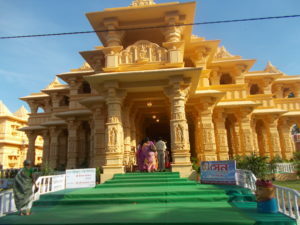 Scholars say that the belief of the Deity Durga’s existence was well established even before Devi Mahatmya was composed. Durga Puja’s mention in the Indian texts is conflicting. Some version of the puranas with the King Suratha legend, call it a spring festival. But the Devi-Bhagavata Purana and two other Shakta Puranas call it an autumn festival. Some Scholars and Historians believe that the Durga Puja festival became noteworthy after the Medieval era Muslim invasion. 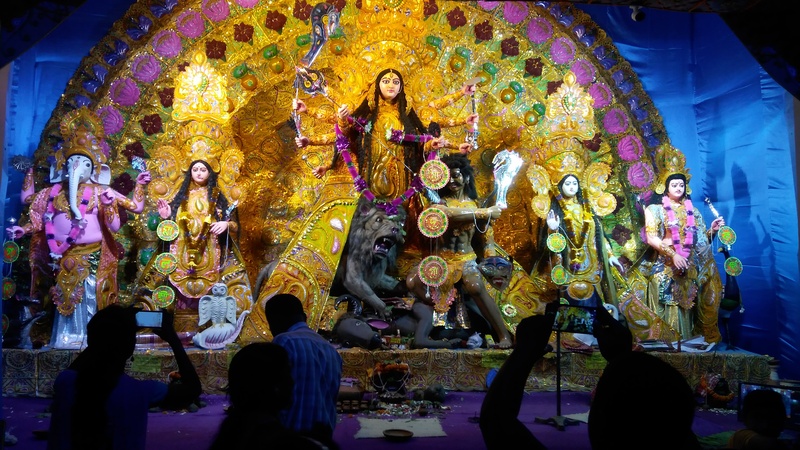 The oppression of Hindus in Bengal Sultanate led to the re-establishment of Hindu identity and saw Durga Puja become an important Hindu festival celebrated socially. Durga Puja is a major festival in the Shaktism ideology of Hinduism. Primarily it is the celebration of Goddess Durga’s victory over the Demon Mahishasura. Mahishasura had achieved the boon of being invincible from any male. Thus the festival epitomizes the victory of good over evil, but it is also considered a harvest festival that considers the Goddess as the motherly origin behind all of life and creation. The festival is a ten-day event, but the last five are historically celebrated as the main festival days. The festival begins with Mahalaya, a day where people following the Shakta ideology of Hinduism remember the departed loved ones. Also, Mahalaya is the advent day of Durga. The next most significant day of the festival is the sixth day, called Shashthi. On Shashthi, people welcome the goddess and festive celebrations are inaugurated. On the seventh (Saptami), eighth (Ashtami) and ninth (Navami) days, Goddess Durga along with her children – Lakshmi, Saraswati, Ganesha and Kartikeya are worshipped. These four days mark the main Puja (worship), where the scriptures, the legends of Durga in Devi Mahatmya. The celebrations end with Vijaya Dashami (“Tenth Day of Victory” ). When, amid loud chants and drumbeats, people in huge processions carry idols to local rivers and immerse them. The deities are seen wearing traditional clothes, the Goddesses wear Saree. Mahasaptami: bathing of the goddess, selection of the priest, descriptive prayers, recitation of texts describing Durga heading to war against evil is done on the seventh day of the festival. Mahastami: It is the eighth day of the festival. Like Saptami, on this day there are more prayers, recitation and enactment of Durga’s legends. The day is significant because the moment when it ends and ninth day begins is considered the moment Durga kills Mahishasura. Sandhi Puja: It is among the most important rituals during Durga Puja. It is a forty eight minute ritual that acknowledges the climax of war between Goddess Durga and Mahisasura. The ritual is started exactly at the time Mahastami ends and Mahanavami starts. Mahanavami: the ninth day of festival observes ceremonies similar to the previous two days. However, this day is the day after Goddess Durga defeated Mahisasura. The new addition to the activities of the day is the Vedic style homa (fire oblation). In India, Durga Puja is the biggest and most widely celebrated festival of West Bengal. Orissa, Jharkhand, Bihar, Assam and Tripura also celebrate the festival in a grand manner. Several other places in India, wherever there is presence of Bengali community, from Delhi to Chennai, there are Durga Puja celebrations. Durga Puja now has a significant international repute. Over time the festival has become a marquee festival associated with the Bengali community. As a result people in Bangladesh, who not only include the minority Hindus but the Bengali Muslims also celebrate it in a big manner. Due to the presence of Bengali community all over the globe from North America to Europe to Australia, almost every region witnesses the celebrations of the Durga Puja.